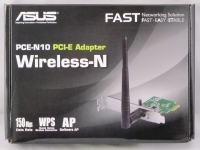 ASUS also has wireless network adapters for both laptops and desktops, they provided the PCE-N10 wireless network adapter for use in this review. 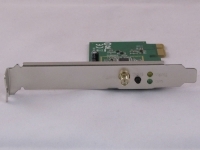 The package for the PCE-N10 looks like the box for the RT-N56U router; and provides similar, detailed information. 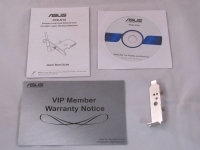 A manual, driver CD, and a low profile bracket are included with the PCE-N10. 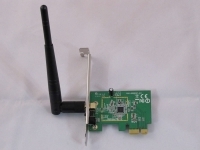 The network adapter is a low profile PCI-Express 1x card with a large single antenna. The low profile adapter can be used to allow this to fit in small form factor cases. 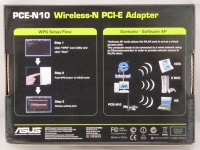 The back of the PCE-N10 provides an antenna connection, WPS button, and two LED status indicator lights.